Manchester United manager Jose Mourinho said "being good defensively is not a crime" as his side edged past Benfica in the Champions League. The only goal of the game in Lisbon came courtesy of Marcus Rashford's long-range free-kick which caught out teenage goalkeeper Mile Svilar on his European debut. Belgian Svilar, the competition's youngest goalkeeper at 18 years and 52 days, had a moment to forget when he carried Rashford's 35-yard free-kick from out wide over his own goalline. Rashford gave United a cause for concern when he limped off with a knee injury in the second half and was replaced by Anthony Martial. United were criticised for their approach in their goalless draw against Liverpool on Saturday in which they hit the target just once, but the Red Devils have now conceded just six goals all season. "We were the team that was positive and we were always in control," said former Benfica boss Mourinho. "I never felt that we could concede a goal, we were very solid defensively. "Sometimes I feel that to be good defensively is a crime but it is not a crime. To be good defensively is one step to get results. We knew the Benfica pressure could not stay for 90 minutes. "The amazing defensive work Liverpool did against us, Benfica could not do that for the whole game. Without any pressure, we knew the goal would arrive." Up until the 63rd-minute goal, the visitors had largely been disappointing, pedestrian in their play and caused few problems for the Portuguese side. Former Benfica midfielder Nemanja Matic forced Svilar into a low save and lashed an effort over the crossbar, as did the disappointing Henrikh Mkhitaryan from a promising position. The home side failed to work David de Gea into a save for the entire game and their best chance fell to Eduardo Salvio in the first half, but the Argentina winger struck wide from inside the box. Benfica were reduced to 10 men late on when veteran centre-back Luisao was given a second yellow card. Mourinho's side top Group A after winning all three games while Basel beat CSKA Moscow in the other match. Although they made hard work of the result, United remain unbeaten in all competitions this season [apart from the Super Cup] and have nine clean sheets from 13 games. Their performance in the first 45 minutes was similar to the draw at Anfield, with striker Romelu Lukaku unable to get into the game and causing few problems in front of goal. But Mourinho's men improved after the break and took control of the contest, forcing the opposition to take hopeful shots outside the box. Serbia midfielder Matic, who played for Benfica between 2011 and 2014, has fitted seamlessly into the United side since joining in the summer from Chelsea and put in another dominant performance on Wednesday. Matic made the most passes (85) and tackles (4) plus more possession gained (14) than any other player on the pitch. He could have scored his first goal for the club but saw his effort pushed away from the near post. Defender Victor Lindelof, who has yet to start in the Premier League but has played all three Champions League games, joined from the Lisbon-based side in the summer and looked comfortable, playing more passes than any other defender. Mourinho, though, will be looking closely at an abject showing by Armenia winger Mkhitaryan, who lost the ball 21 times in the match. Goalkeeper Svilar joined the Portuguese champions in the summer from Anderlecht for £2.2m and has been dubbed "the new Thibaut Courtois". His arrival came after previous number one Ederson joined Manchester City in the summer, and the similarities between the two are clear to see. Like the Brazilian, Svilar plays as a sweeper keeper, rushing off his line to clear the danger. His first act in the match was to sprint outside the area and from his 36 touches on the ball in the match, 11 came outside the box. He looked confident for much of the game, making saves off Matic, Martial and Rashford, but then made the error that handed United the goal. Svilar was looking to anticipate Rashford's free-kick but the ball sailed over his head, and as he back-peddled to try to keep the ball out, the referee pointed to his watch to signal a goal. It cost his side the points, leaving them bottom of the table without a win in this season's competition. "The manager said to us to try and shoot and get some crosses towards their goalkeeper because he is young and playing in his first game," said Matic. "This is football and I know he is a great goalkeeper and I wish him well for the future." Mourinho added: "I knew how good the goalkeeper was, I told the players that. We had a little bit of a strategy, especially on set-pieces to make him uncomfortable. 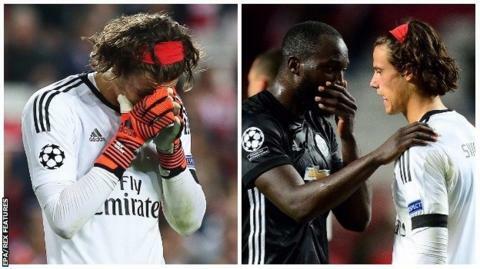 Svilar was close to tears at full-time, turning to his supporters and raising his hands in apology, before fellow countryman Lukaku came over to him with words of consolation and embracing him in a warm hug. Professional job done. A really good away performance. They've dominated the second half. This Benfica side are not as good as the Benfica sides in years gone by but they were really dogged and determined. So it was a really good away performance by Jose Mourinho and his side. The result never looked in real doubt, they never looked like conceding. In Marcus Rashford they had the one player who looked like he could score the goal and he did. Manchester United return to Premier League action on Saturday with a trip to Huddersfield (kick-off 15:00 BST). Manchester United have won their opening three games to a Champions League campaign for the first time since 2012-13 under Sir Alex Ferguson. This is also the first time the Red Devils have won back-to-back away games in the competition since that campaign. Marcus Rashford has been directly involved in 10 goals in all competitions for United this season (six goals, four assists). Only Romelu Lukaku has been involved in more (11 goals, one assist). Lukaku, though, had the fewest touches of any outfield United player to start the game (37), while he was also restricted to just one shot for the second game running. This is the first time that Benfica have lost their opening three games in the Champions League group stages. The Portuguese side mustered 11 shots (including blocked) in this match, but failed to land a single one on target. This was Jose Mourinho's first away win against a club he has previously managed in four attempts since beating Chelsea at Stamford Bridge with Inter Milan en route to winning the 2010 Champions League. Benfica have never kept a clean sheet in their 10 competitive meetings with United. Match ends, Benfica 0, Manchester United 1. Second Half ends, Benfica 0, Manchester United 1. Second yellow card to Luisão (Benfica) for a bad foul. Substitution, Manchester United. Scott McTominay replaces Henrikh Mkhitaryan. Attempt missed. Andrija Zivkovic (Benfica) left footed shot from outside the box misses to the left following a corner. Corner, Benfica. Conceded by Nemanja Matic. Corner, Benfica. Conceded by Antonio Valencia. Attempt missed. Rúben Dias (Benfica) right footed shot from the centre of the box is too high. Assisted by Franco Cervi with a cross following a corner. Substitution, Benfica. Franco Cervi replaces Eduardo Salvio. Corner, Manchester United. Conceded by Mile Svilar. Attempt saved. Anthony Martial (Manchester United) right footed shot from a difficult angle on the left is saved in the centre of the goal. Assisted by Romelu Lukaku. Corner, Benfica. Conceded by Victor Lindelöf. Attempt blocked. Jonas (Benfica) right footed shot from outside the box is blocked. Assisted by Andrija Zivkovic. Corner, Manchester United. Conceded by Rúben Dias. Substitution, Manchester United. Anthony Martial replaces Marcus Rashford because of an injury. Attempt blocked. Jonas (Benfica) right footed shot from outside the box is blocked. Assisted by Filipe Augusto. Attempt blocked. Andrija Zivkovic (Benfica) left footed shot from outside the box is blocked. Assisted by Raúl Jiménez. Raúl Jiménez (Benfica) wins a free kick in the defensive half. Substitution, Benfica. Jonas replaces Diogo Gonçalves. Goal! Benfica 0, Manchester United 1. Marcus Rashford (Manchester United) from a free kick with a right footed shot to the high centre of the goal. Douglas (Benfica) wins a free kick in the defensive half. Corner, Manchester United. Conceded by Lubomir Fejsa.